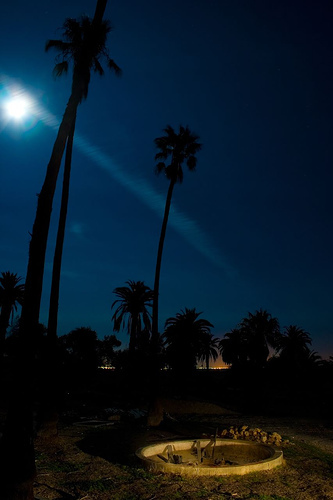 Editor’s Note: Enjoy this final installment of the history of the Greek Orthodox era at Byron Hot Springs. Much of the research material could be found at the Bancroft Library. You may visit the entire set of photos here. Byron was not the first to play up the symbolic healing properties of its waters. The belief in waters carries its own cultural baggage, dating all the way back to pre-classical times. The Egyptians believed in the life-giving aspects of the Nile. Their symbol for the Nile was the lion’s head. 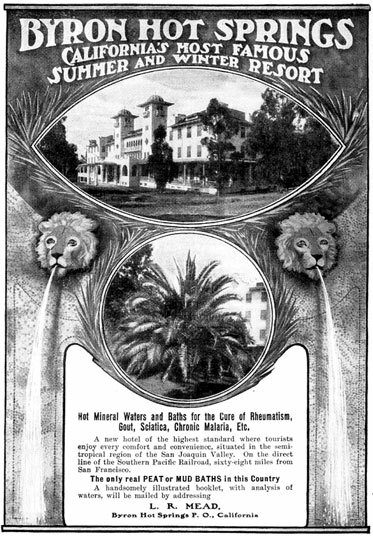 Not surprisingly Byron included lion head fountains in their advertisements. An advertisement possibly dating from the early 1900s before fire destroyed the second hotel at Byron Hotel. Note the two lion’s head figures – symbolic images used in Ancient Egypt to represent life-giving water. Specific to the Christian theology was the spring of Jerusalem, which fed into the two pools of Bethesda. These “life-giving” springs as they were known also cleansed sheep before being sacrificed to God. But, in John 5, their healing purpose was revealed: “In these lay a multitude of invalids, blind, lame, paralyzed, waiting for the moving of the water; for an angel of the Lord went down at certain seasons into the pool, and troubled the water; whoever stepped in first after the troubling of the water was healed of whatever disease he had.” The fifth chapter of John goes on to describe the parable of Jesus’ healing of the lame man at the pool. In chapter 9, Jesus heals a blind man in the nearby Pool of Siloam. 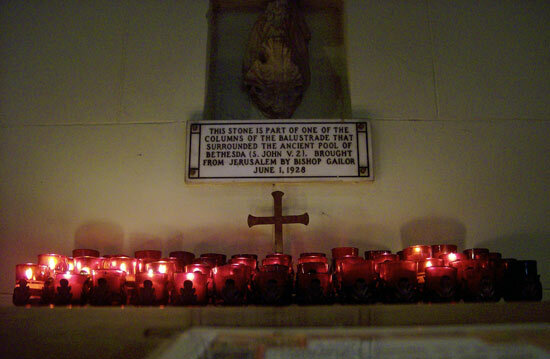 The caption reads: This stone is part of one of the columns of the balustrade that surrounded the ancient pool of Bethesda (5 John V.21) Brought from Jerusalem by Bishop Gailor, June 1, 1928. Image by Gary Bridgman, creative commons, 2.0. The sacramental rites of the Greek Orthodox church are also known as the seven holy mysteries. Amongst the seven, baptism is the linchpin. According to Chrysostom, “It is through baptism that we received remission of sins, sanctification, communion of the spirit, adoption, and life eternal.” Even more important to note is that, unlike Roman Catholicism, the Orthodox church does not limit sacraments. Anything, from a pomegranate tree to a pillar with a cross, to a hot spring, could be imbued with a sacred, salvatory status. At Byron, even before the Greek Orthodox occupation of the site, the water’s healing properties go beyond a simple holistic, physical approach. Advertisements for the springs and descriptions of the site regularly included religious allusions. At Byron, “a person could arrive on crutches and walk out completely revived” (Jensen 33). Letters written by previous visitors to the site frequently quoted biblical place-names and scriptures. Letters from visitors to other California springs called such springs a “balm in Gilead” and “pool of Siloam” (Aetna Springs 26,28). Others went so far to say that hot springs gave them a “new blood and new life” (their italics). The irony of this photo from inside the hotel is apparent when one sees the symbol of Satanism in a building that once housed the virtuous Greek Orthodox Church. Looking out the window of the dining room at Byron Hotel. Note the water feature at bottom. This was the main fountain that greeted visitors as they entered the hotel. In such a way, Byron had become a spiritual retreat, not only for healing, but also for escape from the trappings of urban life. It was a rural “temple on the hill,” isolated from any evil influences and modern distractions. It was nestled amongst an alkali flat, below the ironically named Diablo Mountain range, surrounded by symbolically evil place names and landscapes. Thus, when bishop Athemagoras I dedicated the property in 1948 as Mission St. Paul, he envisioned it as a spiritual escape, a bishop’s see, and the center for Greek Orthodox activity for the entire western United States. The vision was big, but the outcome not so. An abandoned grave site at Byron Hot Springs Resort. This photo is an orphan work, and I am not aware of who took the photo, nor am I aware of where exactly the grave is in the Byron Complex. “Aetna Springs, Pope Valley, Napa County, California, The” Napa City: Napa County Reporter, 1879. Faulkner, William B. “Faulkner’s Handbook and Directory of Murray Township, Alameda County, Cal.” Livermore: The Livermore Herald Steam Printing House, 1886. Kelly, Sandra. “Unpublished, Taped Interview with John G. Moody.” April 25, 1977. Available from the Bancroft Library of the University of California, Berkeley. Jensen, Carol A. “Byron Hot Springs.” San Francisco: Arcadia Publishing, 2006. Green, Miranda. “The Religious Symbolism of Llyn Cerrig Bach and Other Early Sacred Water Sites.” January, 2000. < http://people.bath.ac.uk/liskmj/living-spring/sourcearchive/ns1/ns1mg1.htm >. This entry was posted on Saturday, January 24th, 2009 at 2:28 pm	and is filed under Built Environment, Geotagged, History, Must See Geography. You can follow any responses to this entry through the RSS 2.0 feed. You can skip to the end and leave a response. Pinging is currently not allowed. 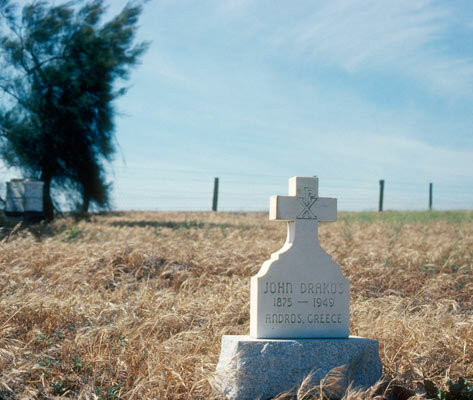 If anyone’s still interested, the grave of John Drakos lies in the northwest corner of the Hot Springs complex. The marker is gone and has been for years. I know because I almost dug him up twelve plus years ago with a bulldozer. 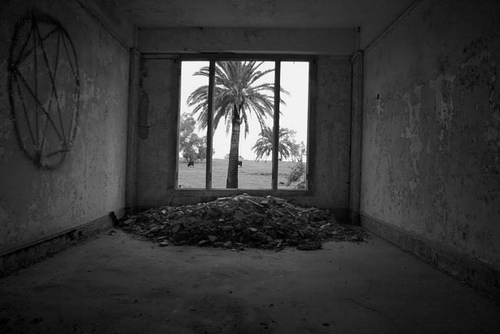 I had info that there was a grave out there somewhere, and fortunately was being cautious. Uncovered the vault and immediately covered it back up, and thereafter avoided the area. No Idea how old that photo is, but it has to be earlier than the late 90′s.